Zinc oxide is a fluffy white to yellow white powder having a very fine physical particle size (99.9% should pass a 325 mesh screen). It is made using one of two processes that produce different densities. The French process vaporizes and oxidizes zinc metal, the American process smelts a coal/zinc sulfide mix and oxidizes the zinc fumes. Ceramic grades are often calcined to remove any physical water (so they do not clump in the bag). But these grades also have a larger particle size and lower surface area (e.g. 3 square meters per gram vs. less than 1; however 99.9% still passes 325 mesh). While calcined grades are said to produce less glaze surface defect problems, many ceramists have used the raw grades without serious issues. 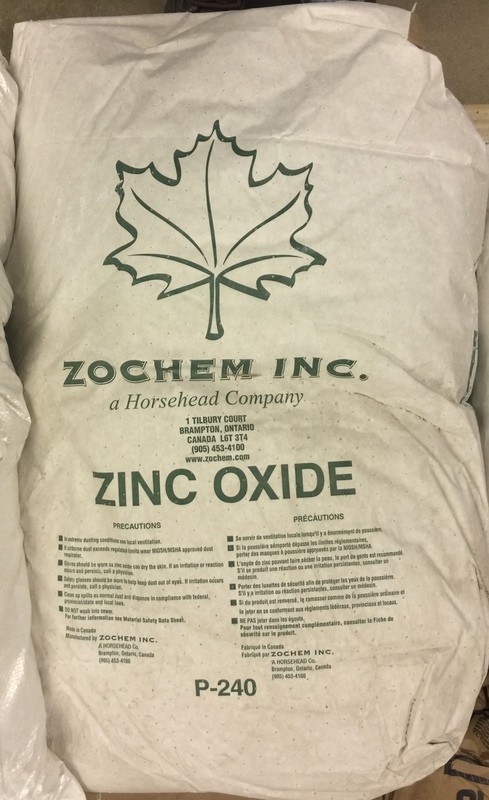 You can calcine (or re-calcine) zinc on your own in a bisque kiln at around 815C. However there are issues: First, because the calcined zinc wants to rehydrate (and get lumpy in the process) you must store it in an airtight container (some people calcine a mix of zinc and kaolin to prevent this, but theoretically such a mix should not even need to be calcined). Second, the calcined zinc may produce slurry thickening issues over time. Many zinc-bearing frits are available (e.g. 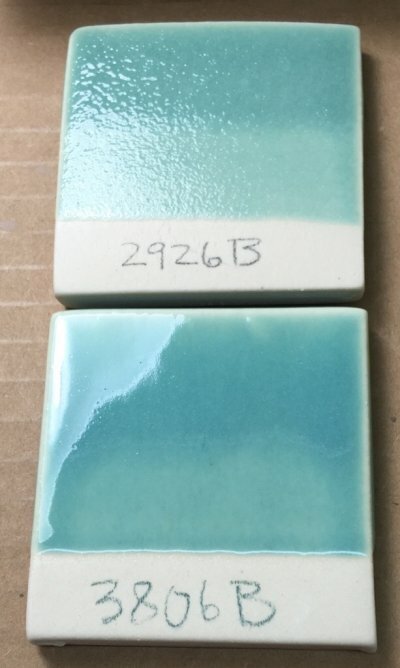 Fusion FZ-16 has 15% ZnO) and incorporating one of them to source it instead of raw zinc oxide will produce glazes that are more fusible, have better clarity and fewer defects (a classic job for glaze chemistry calculations). The use of zinc in standard glazes is limited by its price, its hostility to the development of certain colors and its tendency to make glazes more leachable in acids (although zinc itself is not considered a hazardous substance). Zinc oxide will produce opacity or whiteness, especially at low temperatures, if the calcium content is low. It does not opacify as well in boron glazes. It works well in combination with tin. The top base glaze has just enough melt fluidity to produce a brilliant transparent (without colorant additions). 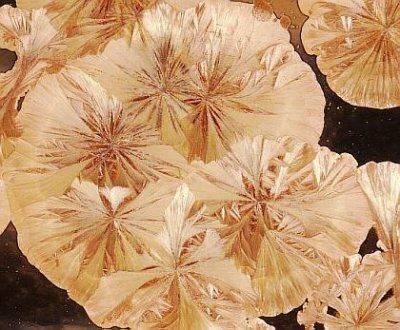 However it does not have enough fluidity to pass the bubbles and heal over from the decomposition of this added copper carbonate! Why is lower glaze passing the bubbles? How can it melt better yet have 65% less boron? How can it not be crazing when the COE calculates to 7.7 (vs. 6.4)? First, it has 40% less Al2O3 and SiO2 (which normally stiffen the melt). Second, it has higher flux content that is more diversified (it adds two new ones: SrO, ZnO). That zinc is a key to why it is melting so well and why it starts melting later (enabling unimpeded gas escape until then). 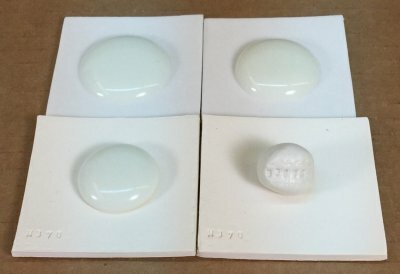 It also benefits from the mixed-oxide-effect, the diversity itself improves the melt. And the crazing? The ZnO obviously pushes the COE down disproportionately to its percentage. These materials have many issues. They can create problems in your glaze slurries (like precipitates, higher drying shrinkage), cause issues with laydown and dried surface and cause fired surface defects (like pinholes, blisters, orange peeling, crystallization). And lithium and barium have toxicity issues (as raw materials). And the lithium, barium and strontium are carbonates, that means carbon burns off during firing (with lithium, for example, 60% of its weight is lost). Yet the oxides that these materials source to the glaze melt, ZnO, Li2O, BaO and SrO can be sourced from frits. In doing that you can solve almost all the problems and get better glaze melting. Fusion Frit F 493 has 11% LI2O, F 403 has 35% BaO, F 581 has 39% SrO and FZ 16 has 15% ZnO. Of course, these frits source other oxides (but these are common in most glazes). Using glaze chemistry you can often duplicate the chemistry of a glaze while sourcing these oxides from frits. The main ore of zinc.